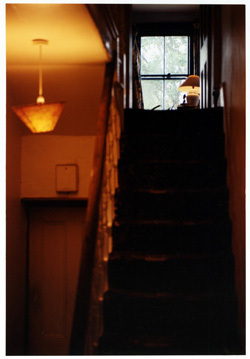 1.View of stairs leading to Laurence's consulting room. The consulting room is situated in his home. 2. Consulting room view. Client's view looking up from couch. "The invitation is to say whatever comes into your mind. Rather than enacting things, the therapeutic relationship is based on speaking, and thinking through the speaking. Things have to be put into language, if possible - inevitably there's a struggle to do this. But the fact that it's all going to end after fifty minutes, that it can't be extended till the next time, creates a container for the work and for all those feelings." "One patient for example took in the blueness of the room. She started to talk about 'blueness' and it became a theme in her discourse. 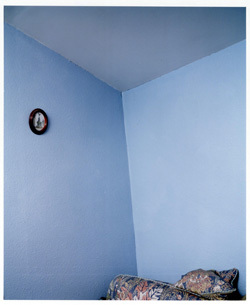 This started with her saying how she loved the blueness of the room, but then spilled out into her seeing blueness - as it were, in her life outside of this room."